In spite of the glorious weather, I spent a good part of the bank holiday weekend shut up indoors watching the TV coverage of the final of the Snooker World Championships from the Crucible theatre in Sheffield. Well, who needs a suntan when you can watch a sport as gripping as this? 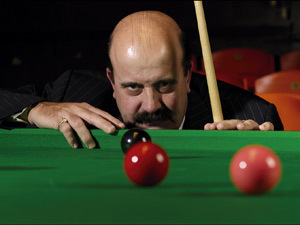 At its finest, snooker bares the souls of its competitors like almost no other sport. One of the players is always forced to remain in his seat, disconsolately sipping on a glass of mineral water as he watches his opponent notch up another massive break. There's nowhere to hide and not a damn thing they can do to influence the result. In those circumstances, the eyes truly are the window onto a tortured soul. It's almost cruel to watch as their hopes slip away slowly, ball by ball, frame by frame. At one point, the TV cameras went out into the crowd picking out famous faces: oh, there's Stephen Fry. He's a huge fan of the game of course. There's Phil Taylor. He knows all about the pressure of appearing in a world final. And so on. Eventually, the camera came to rest on a pair of guys, sitting side by side and with the most remarkable, unbelievable haircuts perched improbably upon the tops of their heads. They looked like they had come from another planet. "Ah", said Willie Thorne, "There's Serge from the band Kasabian and Noel Fielding sitting next to him." As if that wasn't quite enough information, popular culture guru Thorne (aged 59) then felt the need to add, "Kasabian are one of the biggest rock groups in the country at the moment and Noel Fielding is a very funny man indeed." Erm. Thanks for that Willie. The camera lingered for a while, and I just marvelled at how incongruous they looked sat with the rest of the crowd assembled for the snooker. I've been to the Crucible to watch the snooker a couple of times, albeit never for a final, and my lasting impression was that the whole place smelt vaguely of fags and stale bacon grease and had the clientele to match. These two looked about as out of place as a pair of splendid birds of paradise sat amongst a flock of dowdy town pigeons. They also, by the way, looked completely ridiculous. 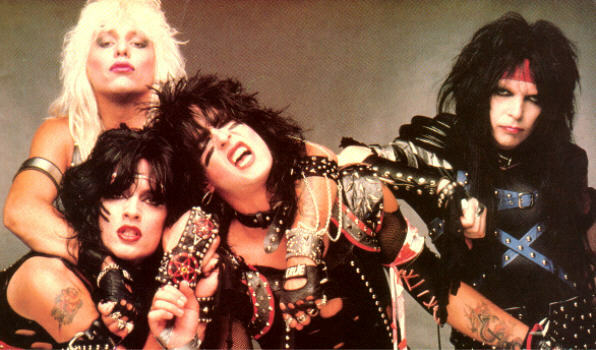 I was reminded of the time - a few years ago now - that I was pushing a trolley around Sainsburys and I bumped into a bunch of guys who all clearly thought they were in Motley Crue in the Los Angeles of about 1988: you know, long hair, aviator sunglasses, ripped jeans, studded leather jackets and massive cowboy boots. Big hair. I can't emphasise the hair enough. they had really, really big hair. One of them was in the trolley and they were waving around bottles of vodka and cases of beer as they browsed up and down the aisles. This was in Sainsburys. In the middle of the afternoon. In a retail park just outside Nottingham. It was astonishing; a truly remarkable sight. If Serge from Kasabian and Noel Fielding looked out of place in the Crucible theatre, then these guys looked suitably bizarre amongst the normal suburban, middle-class shoppers of your average Sainsburys. Asda this is not. They too looked like they had come from another planet - certainly from another era - and I found myself wondering what they did for a living in the real world. Serge is an actual rock star and Fielding likes to imagine that he is the comedy equivalent, but I suppose that at least both of them have day jobs that give them the permission to look quite that ridiculous. What about this lot though? Perhaps they all worked in a call centre and did their normal shopping after work during the week? Maybe they only went the full powder-perm rock look at the weekend? Maybe they were in a Motley Crue tribute band playing Nottingham that weekend. Who can say? I certainly didn't fancy stopping to ask them. They were a touch rowdy. Perhaps I should ask Willie Thorne? I'm sure he'd know. I have to remember that the phrase "...the whole place smelt vaguely of fags..." has an entirely different meaning there than it does here.